The uniforms of the Pittsburgh Pirates from 1977 through 1984 have always fascinated me. Even as a Phillies fan, I found the seemingly endless black/gold/pin options both ghastly and irresistible. 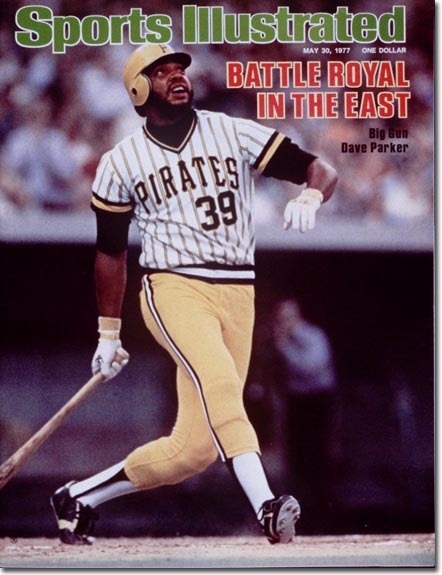 It started the first time I saw this (May 1977) Sports Illustrated with Dave Parker in the unbelievable combination of gold pants and a pin stripped jersey. Suddenly the embarrassing uniforms we had to wear on my little league team weren't so bad. I always knew that I was not alone in my adoration of this "bumblebee" period for the Pirates. A couple of weeks ago, while watching the 1977:This Week in Baseball DVD I started thinking how difficult it would be to document each and every game for these Pirates. I commenced working on through 1977 season, using a variety of sources such as the Google newspaper archive of the Pittsburgh Press and Post-Gazette. It was painstakingly tedious work and you quickly develop a great appreciation of the national media coverage available today for major league baseball. I got about 60% of the 1977 season done before I discovered that this project had already been conceived and accomplished by a similarly obsessed baseball uniform fan. Jerry Wolpe is the founder and research guru behind the website BucTracker. He completed the incredible feat of recording a game by game account of each and every uniform the Pirates wore during this seven year period. This work is mind-blowing and far ahead of anything I could hope to create. Since Jerry had already done the heavy lifting, I decided to turn my attention to something better suited for my graphical nature. More than any other Pirate team in that era, the 1979 "We Are Family" squad was the most memorable. Led by Willie Stargell, these guys pounded their way to what could be the last World Series trophy in Pirate history. Using the uniform data research provided by BucTracker (augmented by a little bit of pattern determination/guess work to fill in the blanks) -- I created this infographic detailing the 173 (thanks Jangler!) 172 game uniform choices of the 1979 Pittsburgh Pirates. Apparently I had imagined any combination where the White shirts/pants did not appear as a matched set (apart from the hat). I am fixing this now. Those jerseys were so cool just like many uniforms from that era. It takes a lot of boldness and swagger to play in them things and win at a high level lol. Love the blog btw check mine out http://truschoolsports.blogspot.com/ feel free to join the site if you like what you see.